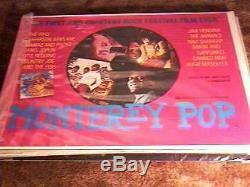 MONTEREY POP - BRITISH QUAD ORIGINAL RE-RELEASE MOVIE POSTER FROM 1978. POSTER MEASURES 30" X 40". POSTER IS IN EXCELLENT CONDITION AND ROLLED. THIS POSTER IS NOT A REPRO OR REPRINT , THIS IS AN ORIGINAL THEATRICAL MOVIE POSTER PRINTED BY THE STUDIOS. The item "MONTEREY POP ROLLED BRITISH QUAD RR78 HENDRIX OTHERS" is in sale since Sunday, May 28, 2006. This item is in the category "Entertainment Memorabilia\Movie Memorabilia\Posters\Originals-International\1990-99". The seller is "tloceposters" and is located in Rochester, New York. This item can be shipped worldwide.